The Race: Nowhere Else in the World!! 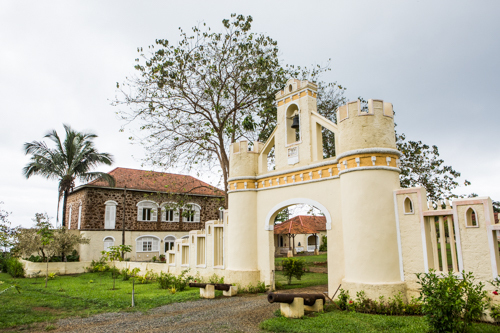 Scientists and graduate students from the California Academy of Sciences have been visiting and studying the Republic of São Tomé and Príncipe for the past 17 years. This two-island nation off the West coast of Africa in the Gulf of Guinea has just revalued and redesigned its currency, the Dobra. And rather than celebrating political leaders, historical events or man-made structures and industry, the new notes illustrate what makes the islands truly special among islands of the world – their unique wildlife. Colorful wildlife stamps are not rare of course but in this case, São Tomé and Príncipe are celebrating species unique to the islands – their endemics. The new twenty dobra note (above) celebrates the São Tomé giant tree frog, Hyperolius thomensis, largest member of its genus in the world. It is found only in the higher forests of the big island – nowhere else. The new note was fashioned directly from a photograph by Dong Lin, photographer on the first California Academy of Sciences scientific expedition to the islands in 2001. Dong Lin, CAS photographer, F. Penny and R. Stoelting, members of the first Academy Gulf of Guinea expedition in 2001 posing the giant tree frog for the original photo below. 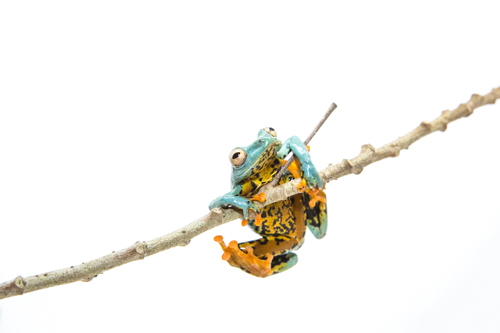 This brilliantly colored tree frog was also the subject of the first scientific paper based on collections made by our expeditions. Since 2001 there have been 38 additional publications based on twelve more expeditions joined by more than 40 scientists and graduate students. The 5 dobra note (top right) denotes one of two endemic (non-flying) mammals on the islands: the São Tomé shrew, Crocidura thomensis. The shrew was the subject of a 2015 publication by Dr. Ricardo de Lima of the University of Lisbon, along with three Academy colleagues. Later, another colleague, Dr. Luis Ceriaco of the Natural History Museum in Lisbon described an endemic shrew from Príncipe. The ten, fifty and 200 dobra notes feature endemic bird species. The islands of São Tomé and Príncipe have the highest number of unique bird species in the world by unit area. This fauna has been intensively studied and brought to the world’s attention by our colleague, Dr. Martim Melo of CIBIO in Portugal. Only one bank note depicts a non-native animal – the 100 Dobra bill shows a Mona monkey, a species introduced from the mainland as a food source. Finally, another of our colleagues who has joined us in the field and helped bring attention to the islands’ fabulous wildlife is the irrepressible Dr. Luis Mendes, famed Portuguese entomologist (above). Luis has been studying the butterflies of the islands and the African mainland for his entire career; the obverse side of each of the new Dobra notes bears an image of his butterflies (below). 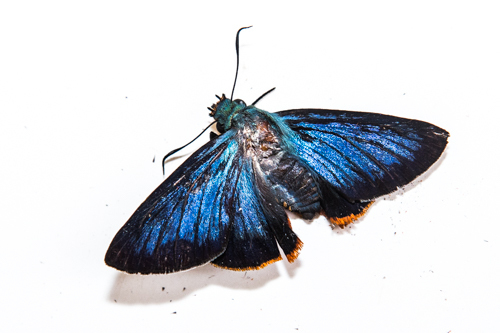 Many of these lepidopterans are found on either one or the other island or both, but nowhere else in the world. Pretty animal species frequently appear on stamps, but in the case of São Tomé and Príncipe, there is special significance. These two little islands rival the more famous Galapagos and Hawaiian islands in possessing an unexpectedly high number of unique plant and animal species, in spite of their smaller size. This would not be predicted by modern modeling nor is it yet well understood. The new currency signifies that the people of the islands recognize that their islands’ unique environments set the country apart as truly special in the world. Clearly, the recent decade or so of field work and scientific effort has meant something to the citizens, and this is very heartening to us, the scientists who visit and seek to understand the evolution of life on “the Islands at The Center of the World”. First, our heartfelt thanks to the citizens of the islands for allowing us and our colleagues to work among them. 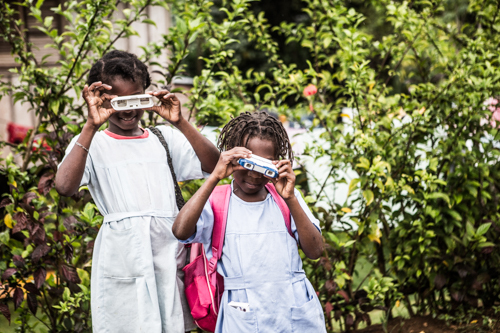 Our research and educational expeditions are supported by tax-deductable donations to the “California Academy of Sciences Gulf of Guinea Fund*.” We are grateful for ongoing governmental support from the Republic of São Tomé and Príncipe, and especially to Arlindo de Ceita Carvalho, Director General, Victor Bonfim, and Salvador Sousa Pontes of the Ministry of Environment and to Faustino de Oliviera of the Department of Forestry for their continuing authorization to collect and export specimens for study, and to Ned Seligman, Roberta dos Santos, Anita Rodriguez and Quintino Quade of STePUP of Sao Tome, our “home away from home”. GG IX, X and XI were funded in part by a generous grant from The William K. Bowes Jr. Foundation, and substantial donations from Rod C. M. Hall, Mr. and Mrs. Henri Lese, Mr. and Mrs. John L. Sullivan Jr., Mr. and Mrs. John Sears, in memory of Paul Davies Jr. and a heartening number of Bohemian friends. We are grateful for the support of Roça Belo Monte (Africa’s Eden-Príncipe) for both logistics and lodging. Author islandbiodiversityracePosted on January 7, 2018 January 9, 2018 Categories amphibians, Biodiversity, biogeography, birds, frogs, Gulf of Guinea, Island endemics, island people, principe, Sao Tome, shrews, stampsLeave a comment on The Race: Nowhere Else in the World!! Laguna Azul, an exquisite bay in northwestern São Tomé, with hanging Baobab seed pod. Weckerphoto, GG III. The scientific name of each living species is like the handle on a drawer, enabling biologists to pull it open and learn all that has been observed and written about that species. These names, usually Latinized or in Greek, are the most basic building blocks in any attempt to describe the Earth’s natural habitats and ecological systems… literally the first step in the exploration of unknown or poorly known habitats. First question asked: what’s living there? If no one has noted a species before, we communicate its existence by describing it and giving it a name..
Our first expedition to the islands of São Tomé and Principe was in 2001, and the first new island species our scientists described was a beetle (below). Although it was collected high in the mountains on São Tomé during our first expedition, the new name was actually published four years later. Straneo seligmani Kavanaugh, a new carabid beetle from near Macambrara, São Tomé at about 1100 m. Straneo is an endemic genus; its two known species occur only on this island.. It takes a lot of time to recognize and describe a new species; after all, the scientist has to know all of related species that the new species is not! This new beetle was named for Ned Seligman, Director of STeP UP, an island NGO. We have worked closely with STeP UP since the beginning in 2001. Another special insect collected on our first expedition was an ant species new to science; it was described a few years later (below). During the past 17 years, our teams have undoubtedly collected many new insect species on São Tomé and Príncipe. But it takes a lot of time for entomologists to sort through our nearly two decades of island specimens. The bryophyte flora (mosses, liverworts and hornworts) was poorly known before tireless Jim Shevock joined us on several recent expeditions. The new moss species described by Jim and his colleagues (below) is but the first of many awaiting publication. In fact, Jim and his colleagues such as Dr. Cesar Garcia the University of Lisbon (above) have added 46 mosses, 66 liverworts and 3 hornworts to the flora of the islands so far, suggesting that this group is surprisingly rich these ancient islands . Lizards are usually a fairly conspicuous part of any environment during both day and night (geckos), so it might be expected that the lizard fauna of the two islands would be well known. Not so; our teams have described one new species and are working on a second. Hemidactylus principensis Miller, Sellas & Drewes. Weckerphoto. This nocturnal gecko of Príncipe Island shares a unique character with its nearest relative, H. greeffii of São Tomé – the absence of the last digit on the thumb (below). Radiograph: Hemidactylus principensis (A), H. greeffii (B)) showing absence of terminal thumb digit. An additional new species was described a couple of years ago by Dr. Luis Ceriaco of the University of Lisbon. The skink lives on Tinhosa Grande, an islet off the south coast of Principe. Trachylepis adamastor Ceriaco, Tinhosa Grande island. Several earlier blogs have featured our mushroom work ; in earlier times, there were only about twelve known species on the islands. Drs Dennis Desjardin and Brian Perry collected more than 200 kinds during GG II and III expeditions, and their analysis of these specimens is ongoing. Scytinopogon havencampii Desjardin & Perry of Principe (above) was named in honor of a group of friends who helped fund this particular work. Earlier this year, four additional new species from both islands were described by Desjardin & Perry and just this week, the same authors published yet another scientific paper in the international journal, Mycosphere. They recognized 31 hitherto unreported fungus species on the islands, and these include ten new ones; three of the new species names commemorate individuals who have helped support our expeditions: Campanella burkeii, Gymnopus rodhallii and G. billbowesii. Campanella burkei Desjardin & Perry from Principe Island. Gymnopus rodhallii Desjardin & Perry from São Tomé. Several of our expeditions have included workers studying inshore marine organisms. Then graduate student Dana Carrison-Stone published the descriptions of two new species of barnacles she discovered during dives in 2008 (GG III). Drs Tomio Iwamoto and Luis Rocha have both worked on our Gulf of Guinea expeditions, Tomio since the very beginning in 2001. Luis has led several separate diving expeditions there including GG X in 2016 . Serranus pulcher Wirtz & Iwamoto (above) was described from a specimen Tomio caught by rod and reel off the pier of Ned Seligman’s house on the northeastern shore of São Tomé during GG II. Luis named Sparisoma choati Rocha, Brito & Robertson (below), a new parrotfish from the waters of Príncipe just last year (Rocha phot). Amphibians are not supposed to occur on islands that have never been attached to a mainland source. This point has been made about oceanic islands ever since islands have been studied (see early blogs in this series); for obvious reasons (salt water) the same is true for freshwater fishes. Nevertheless, São Tomé may well be unique in having eight species of endemic amphibians, two of which were discovered and described by members of our Gulf of Guinea expeditions. Phrynobatrachus leveleve Uyeda, Drewes & Zimkus of São Tomé (above) was discovered to be genetically distinct from its Príncipe relative, P. dispar as early as 2007 by Dr. Josef Uyeda, a two-time expedition member. A similar situation exists with the very similar small green tree frogs of the islands. Dr. Rayna Bell discovered that the two island populations were actually quite distinct from one another and named the Príncipe species, Hyperolius drewesi Bell, a great honor. Hyperolius drewesii Bell of Príncipe. Gasparini phot. Finally another graduate student contributor to our island work on São Tomé and Príncipe is Matthias Neumann of the University of Kassel, Germany. His fieldwork on flatworms (aka geoplanids) of the islands led to the description of five new species in a recent publication. His work is particularly relevant as many of these strange, brightly colored species are known predators of land snails, and the snail species of São Tomé and Príncipe are more than 70% endemic, found nowhere else in the world. Various geoplanid flatworms from São Tomé among which are five new species described by Sluys and Neumann. We will be returning to the islands once again in November. Rio Porco, at the remote southern end of Príncipe not far from new Scops owl species site (see last blog). A. Stanbridge phot. “Jita,”the Principe house snake (above, Lamprophis); the Sao Tome form is striped, not blotched. They are different species from each other and from mainland relatives, and we are in the process of describing them. The Belo Monte boat; Pico Mesa in the background. Left, Filipe Spina, Principe Trust biologist with Rayna Bell. Lauren is a relatively new Academy faculty member of our Entomology Department who specializes on the biology of scorpions. 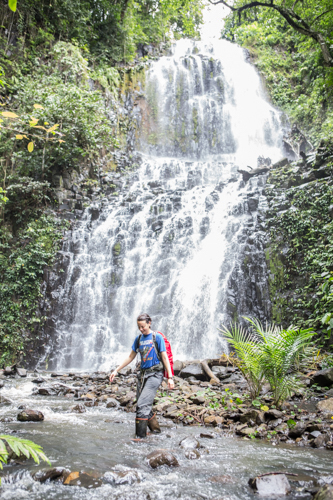 But given that only one species has ever been recorded here (by us on São Tomé in 2001), she is donning the cloak of general arachnologist, sampling spiders, amblypigids and other poorly known island invertebrate faunas. She thus joins the ranks of earlier expedition members such as Drs. Charles Griswold, Joel Ledford, and Tamas Szuts of Hungary. Above is Isometrus, the only scorpion species known from the island; this specimen is from the basalt cliffs of the northwestern part of the island. Scorpions glow under ultraviolet light. Lauren has also been very involved with our education project; she brings the experience of having founded and continues to run an extensive similar program in the West Indies. Rayna Bell (above) has returned as a team member for the fifth time. 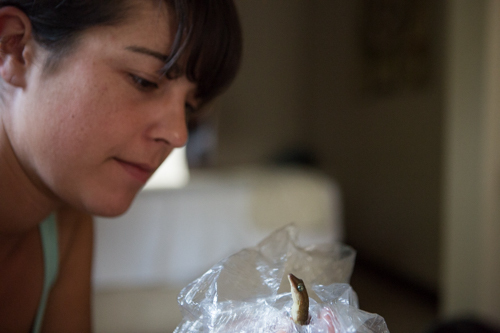 After completing her postdoctoral appointment at the University of California, she became the new curator of herpetology at the Smithsonian Institution, our U.S. National Museum. The new green tree from of Principe Island. .Dr. Bell is currently working on understanding more about the biology of the enigmatic Príncipe giant tree frog, Leptopelis palmatus. Prior to our 2001 expedition this largest of African tree frogs was known only from a single female specimen collected over 100 years ago. During our first work on Príncipe, we were able to collect and describe the much smaller males of this species but even to this day, the larvae (tadpoles) remain unknown. As can be seen above, the highly variable colors and patterns in this species are very unusual; they exhibits a high level of color and pattern polymorphism. The reason for this is unclear; in such cases, this variation is usuall due to natural selection for crypsis (camouflage), mate recognition or sexual dichromatism. We have no evidence that the frogs are particularly distasteful or toxic to predators; i.e., warning or “aposematic” coloration. Also, adult tree frogs of this species appear to attain sexual maturity at varying sizes; reproductively mature males and females on the mainland usually attain a fairly narrow range of size. Early indications suggest this is probably not the case with the giant tree frog of Príncipe, where mature females appear to vary in size within 20-30mm. Maria Adelina Jeronimo has returned with us for her second expedition, having completed all but her thesis defense for her PhD at the New University of Lisbon (Gulbenkian Institution). She is an expert on butterfly genetics, and particularly interested in environmental influences upon gene expression. 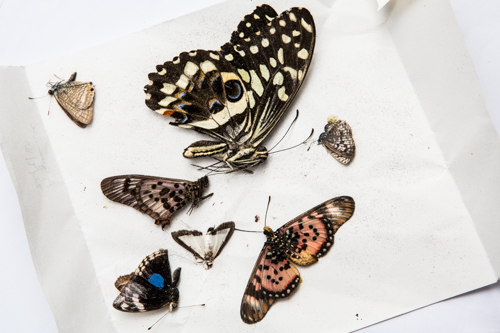 In GG IX, she worked with Dr. Luis Mendes specimens to support his monograph of the island lepidoptera. Lauren and Maria (right) working at night on Sao Tome. Most of Maria’s specimens (below) must be examined in the laboratory before they can be postively identified. In addition to continuing to sample butterfly and moth species in the field, she has been closely involved the production and presentation of our primary school biodiversity awareness program. As readers already know, this program annually reaches around 2,000 third, fourth or fifth grade students in different schools on both islands. Ex Africa Semper Aliquid Novi; indeed, there is always something new out of Africa.I have just learned that Drs Dennis Desjardin and Brian Perry just published the 4th scientific paper based on their collections made on Sao Tome and Principe much earlier (Gulf of Guinea expeditions II and III). Members of Gulf of Guinea IX dining with our old friend and host, Ned Seligman of the NGO, STeP UP. Left to right, Rayna Bell, Cesar Garcia, Lauren Esposito (small son of Danny’s, Bob, Ned, Roberta Ayres, Tom Daniel, Maria Jeronimo and Jim Shevock. Our research and educational expeditions are supported by tax-deductable donations to the “California Academy of Sciences Gulf of Guinea Fund.”* On the islands, we are grateful for ongoing governmental support, and especially to Arlindo de Ceita Carvalho, Director General of the Ministry of the Environment and Faustino de Oliviera of the Forestry Department, Republic of São Tomé and Príncipe, for their continuing authorization to collect and export specimens for study, and to Ned Seligman, Roberta dos Santos and Quintino Quade of STePUP of Sao Tome, our “home away from home”. Gulf of Guinea XI has been funded in part by a generous grant from The William K. Bowes Jr. Foundation, and substantial donations from Rod C. M. Hall, Timothy M. Muller, Mr. and Mrs. John L. Sullivan Jr., Mr. and Mrs. John Sears, and a heartening number of “Coolies”. Once again we are deeply grateful for the support of the Omali Lodge (HBD-São Tomé) and Roça Belo Monte (Africa’s Eden-Príncipe) for both logistics and lodging, and to the Príncipe Trust for partial sponsorship of the production of our primary school, biodiversity awareness education program. Our next expedition, GG XI, departs in November. Since returning from GG IX last year, we have been involved in two subsequent expeditions: that of graduate student Matthias Neumann (University of Kassel) whose work on island flatworms we are supporting, and GG X, our second marine expedition led by Dr. Luiz Rocha, of the Academy. As a result, GG IX has perhaps received less “blog attention” than usual, so I am including a few more images below. Upon arrival on Príncipe Island, we always pay our respects to President Jose “Tose” Cassandra, in order to inform him of our intentions. 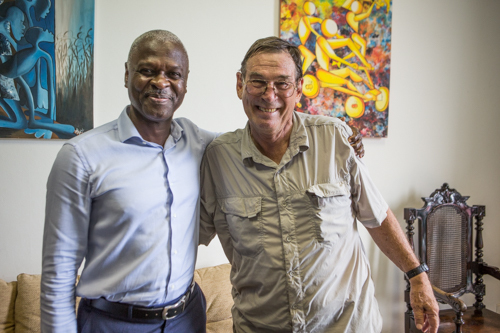 He has been a strong supporter of our scientific and educational work on the island since early days; as can be readily seen, a visit to his office is always a pleasure. To my left is Dr. Maria Jeronimo, Portuguese entomologist. Above, the team is hiking up to the rim of Lagoa Amelia, a crater lake on São Tomé at over 1400 meters. The giant bamboo is an invasive or it was introduced for some reason; it is not native to the islands. One of the major joys of being a field biologist is that one often finds oneself working in wonderfully beautiful places like these. Kids watching a video of themselves dancing in an abandoned roça (plantation house). At about 700 m in elevation in the Contador Valley on the northwest side of São Tomé, there is a kilometer-long tunnel/aqueduct that is a great locality for bats, amblypygids, geckos(below), and other normally night-time critters of interest. The team in route to the tunnel: Dr Luis Mendes, Dr Rayna Bell, Lauren Scheinberg, Drewes, Dr Maria Jeronimo and K. B. Lim. Lauren Scheinberg and Rayna Bell in the tunnels. Drewes, Quintino Quade and K. B. Lim in the tunnels. The giant, four-fingered gecko of Sao Tome, Hemidactylus greefi. The tunnel entrance is behind us; we are examining specimens just collected . To the left is Scheinberg, Drewes, K.B.Lim, manager of the local power plant, Dr. Luis Mendes (foreground) and Quintino Quade. The water of the Rio Contador is eventually directed to the country’s only brewery, far below in the town of Neves. Here ROSEMA, the local beer, is produced; we feel this is a noble enterprise and support it frequently and enthusiastically. Dr. Luis Mendes with Quintino Quade on the hunt. The prey: a silverfish, one of Luis’s academic specialties. Below, Dr. Rayna Bell of the Smithsonian Institution with a São Tomé giant treefrog, Hyperolius thomensis. Rayna has been studying the genetics and evolution of the unique tree frogs of the islands for a number of years. 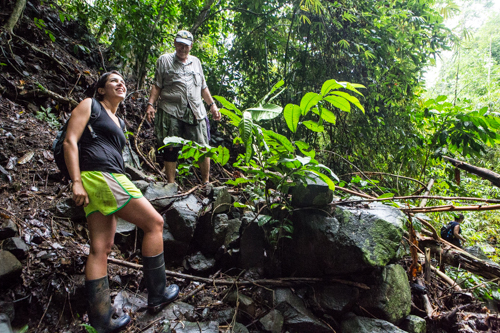 Above, three members of the team work an unnamed waterfall on the west side of Príncipe Island; from left to right: Dr. Maria Jeronimo, Rayna and Lauren Scheinberg. Shortly after this image was taken, Rayna Bell collected a large female Príncipe giant tree frog (Leptopelis palmatus). 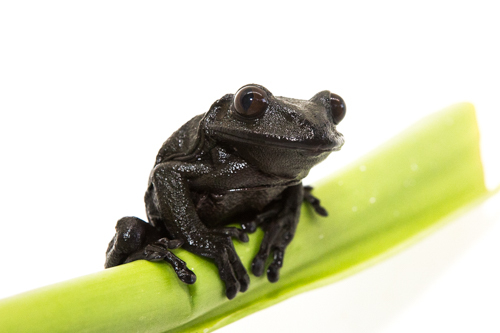 Not only is it rare to find such an animal during daylight hours, this is also the only all-black African tree frog specimen I have ever seen in a lifetime of studying them. 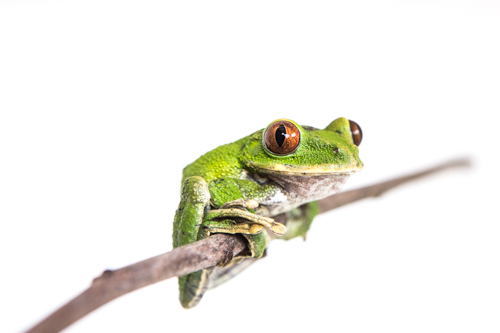 Tree frogs always protect their under surfaces against water loss by evaporation; thus the frog is perched (above) on the largest smooth surface available nearby- our indomitable photographer, Andrew Stanbridge. Andrew is the veteran of six expeditions and has provided us with invaluable photographic documentation of our past six years of fieldwork. Drs Jeronimo and Luis Mendes, our GG IX entomologists, examine the latest butterfly capture (above) and below, Roberta Ayres, coordinator of all of our education efforts examines the oddest vertebrate on São Tomé, the unique legless amphibian or caecilian (Schistometopum thomense) known to the locals as “Cobra bobo” and greatly feared as well. Its nearest relative is found thousands of kilometers to the East in Tanzania and Kenya. Caecilians are harmless. Roberta Ayres near São Nicolao, São Tomé. The eleventh expedition will run from mid-November to mid-December and will include nine scientists, two of them new to the project. Our botanists, Drs Tom Daniel and Jim Shevock, will be joined for the first time by Dr. César Garcia (below left) of the University of Lisbon, Museum of Natural History. César is a bryophyte specialist who has already worked and published with shevock; together they will continue to survey the moss, liverwort and hornwort flora of the islands. 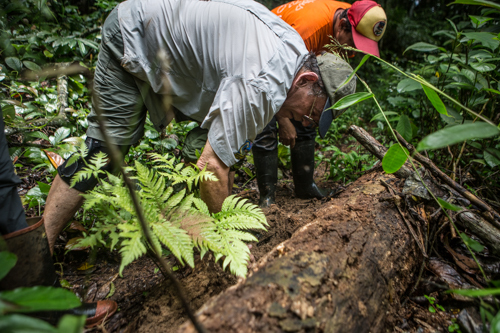 This year the botanists will again attempt a survey of the remote Pico Mesa on Principe. Dr. Lauren Esposito (above, right, with an American crocodile in hand – Crocodylus acutus) is a new member of the faculty of CAS and a specialist on arachnoids. She and returning entomologist Maria Jeronimo will continue with our ongoing broad survey of the insect faunas of the islands. Roberta Ayres, our education head, Rayna Bell, Andrew and I round out the members of GG XI. While on Príncipe we will hopefully be joined in the field by Felipe Spina a bee biologist with the Príncipe Trust. Each year, we look forward to seeing our local collaborators and friends such as Quintino Quade, his wife Anita Rodrigues and Roberta dos Santos all from the NGO STeP UP, Arlindo Carvalho of the Ministry of the Environment, our “friend on the mountain,” Henrique Pinto da Costa and many, many others. We are very fortunate to have the support of both the Omali Boutique Hotel on São Tomé and Roca Belo Monte on Príncipe (above left and right respectively) who provide us with logistical support during our expeditions; this has been vital to the success of our Gulf of Guinea projects over the years. Storm brewing on the southeast coast near Rebeira Peixe, Sao Tome. 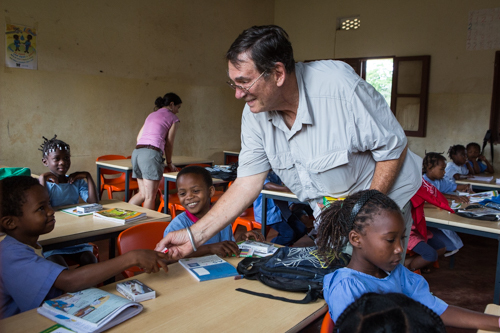 Our research and educational expeditions are supported by tax-deductable donations to the “California Academy of Sciences Gulf of Guinea Fund.”* On the islands, we are grateful for ongoing governmental support, and especially to Arlindo de Ceita Carvalho, Director General, Victor Bonfim, and Salvador Sousa Pontes of the Ministry of Environment of the Republic of São Tomé and Príncipe for their continuing authorization to collect and export specimens for study, and to Ned Seligman, Roberta dos Santos and Quintino Quade of STePUP of Sao Tome, our “home away from home”. The upcoming GG XI has been funded in part by a generous grant from The William K. Bowes Jr. Foundation, and substantial donations from Rod C. M. Hall, Timothy M. Muller, Mr. and Mrs. John L. Sullivan Jr., Mr. and Mrs. John Sears, and a heartening number of “Coolies”. 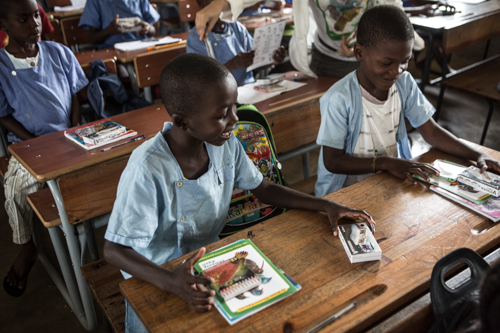 Once again we are deeply grateful for the support of the Omali Lodge (São Tomé) and Roça Belo Monte (Príncipe) for both logistics and lodging, and to the Príncipe Trust for partial sponsorship of our ongoing primary school education program. 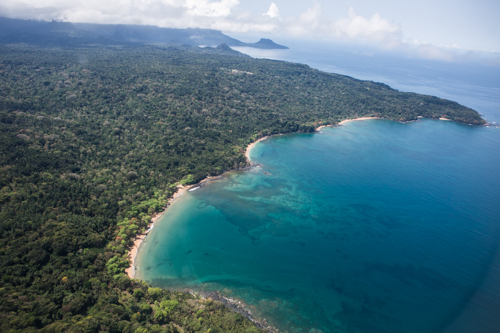 The new header image of Príncipe Island from the east (above) was made by our friend, Jan Fourie, of Africa’s Eden; Príncipe is 31 million years old and was much, much larger in the Oligocene. Revisiting the famous “Bode of Bombaim” with cobra skin in hand, along with our indefatigable photographer, Andrew Stanbridge (left). This area of central São Tomé seems to harbor sizable numbers of forest cobras (Naja nigricollis), the islands’ only venomous snake species, thought to have been introduced by early Portuguese settlers. We have extracted DNA from Bode’s skins to test this hypothesis. 3/4ths of the members of GG IX. Dr. Rayna Bell, UC Berkeley; Lauren Scheinberg, CAS; Maria Jeronimo, Gulbenkian U; and Dr. Luis Mendes, Nat. Hist. Mus., Lisbon. Absent are Roberta Ayres (CAS), Andrew Stanbridge, photographer and me (CAS). Some more updates from GG IX: Dr. Luis Mendes is completing his monograph on the butterflies of the islands. He informs us that he collected about 400 specimens during GG IX. His collections represent 40 species of six families from both islands with new records and observations of endemics. 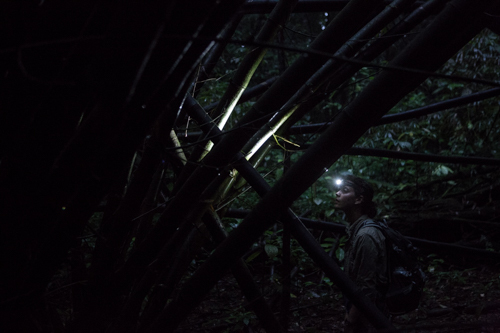 Jim Shevock (above) of CAS, is a veteran of three past Gulf of Guinea expeditions, and has just published a sixth scientific paper on bryophyte flora of the islands. It is plain that the bryophyte flora of the islands is much more diverse than had been thought and Jim has many more species to be and new ones to describe especially. Jim will be a participant on GG XI in November. Dr. Rayna Bell (above left), now of the Smithsonian Institution, continues her work with the treefrog genus Hyperolius. The opportunity arose for us to sample the southern part of the Obo Natural Forest on São Tomé where, it turns out, the giant tree frog (H. thomensis) is much more easily found and observed. There are some intriguing biological issues involving genetic interaction between these two species which are so different in size and color (above right), and Rayna continues her studies of them and the giant tree frog (Leptopelis) of Príncipe. 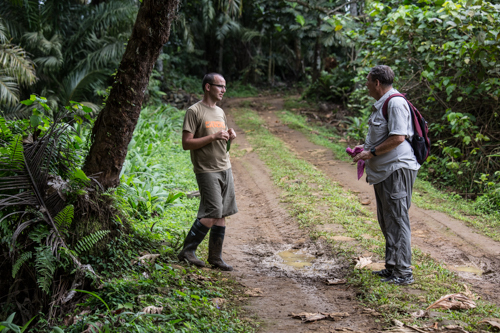 Drs Bell and Ricardo Lima in the forest of São Tomé, inland of Angolares. On the academic side of things, the Island Biology Conference held in July at the University of the Azores on Terciero Island was a great success with over 400 scientists and students in attendance for a week. At the first such meeting held in Hawaii there were only two presentations on Gulf of Guinea science; in the Azores, we had a day-long symposium featuring talks on many aspects of island biogeography and conservation. Dr. Bell presents an amphibian paper at the Gulf of Guinea Symposium, Terceiro Island, Azores. Such meetings facilitate useful interactions between scientists and students, allowing them to avoid overlap of effort and at the same time promoting cooperation; we were very heartened by the increase in the number of people doing research and educational activities on the islands. projects (above). Both are authorities on forest ecology, the Gulf of Guinea bird fauna and the interactions of human populations with the environment. 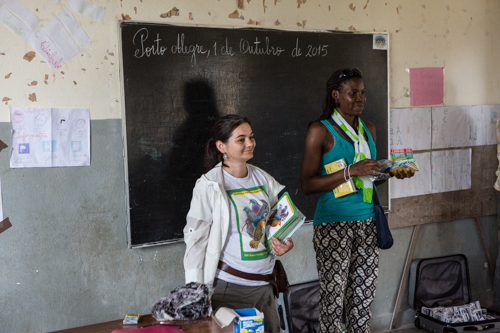 After several years of work in Mozambique, Mariana is returning to the islands where she will continue her work under the auspices of Birdlife International. Ricardo was one of the organizers of the symposium. In several previous blogs I have mentioned Hugulay Maia, a Sao Tomean from the town of Angolares on the southeast coast. We first met Hugulay years ago through his mentor and friend, Angus Gascoigne, an accomplished resident naturalist on São Tomé. Tragically, Angus passed away a few years ago; he would have been very proud to learn that Hugulay is now pursuing PhD research on the coastal fishes of the islands. Hugulay diving on Príncipe, GG.X (left) and preparing specimens (right, with Dr.Ricardo Rocha (CAS), and graduate student, Luisa Fontoura. (far right, U. Catarina, Brazil). Maia was a member of the GG X marine team, as was his doctoral advisor, Dr. Sergio Floeter of University of Santa Catarina, Brazil. A few months ago in Lisbon (below), he presented part of his thesis work to the Gulbenkian Foundation in Lisbon, one of the major funders of his work on coastal fishes. Our next terrestrial expedition, GG XI will be in November and will be the topic of the next blog. Here at Praia Jalé in southeastern São Tomé is a leatherback sea turtle (Dermochelys coriacea), one of several species of ocean-going sea turtles that breed on the islands annually. Looking on are our old friends Bastien Loloum, his wife Delicia and kids Flora and David. Bas said: “The nesting turtle got surprised by sunlight and was just finishing up [laying eggs] as we arrived by her side. The picture was taken by a German tourist who was also staying at the lodge that same night.” This is the world’s largest turtle and the 4th heaviest reptile (after 3 monitor lizards). These giants can reach 2.13m (just under 7 feet) with a mass of 650 kg (1433 lbs)! The research expeditions are supported by tax-deductable donations to the “California Academy of Sciences Gulf of Guinea Fund”* On the islands, we are grateful for ongoing governmental support, especially to Arlindo de Ceita Carvalho, Director General, Victor Bonfim, and Salvador Sousa Pontes of the Ministry of Environment, Republic of São Tomé and Príncipe for their continuing authorization to collect and export specimens for study, and to Ned Seligman, Roberta dos Santos and Quintino Quade of STePUP of Sao Tome http://www.stepup.st/, our “home away from home”. GG VIII, IX , X and upcoming GG XI have been funded by a generous grant from The William K. Bowes Jr. Foundation, and substantial donations from Mrs. W.H.V.“D.A.” Brooke, Thomas B. Livermore, Rod C. M. Hall, Timothy M. Muller, Prof. and Mrs. Evan C. Evans, Mr. and Mrs. John L. Sullivan Jr., Clarence G. Donahue, Mr. and Mrs. John Sears, and a heartening number of “Coolies”, and members of the Docent Council of the California Academy of Sciences. 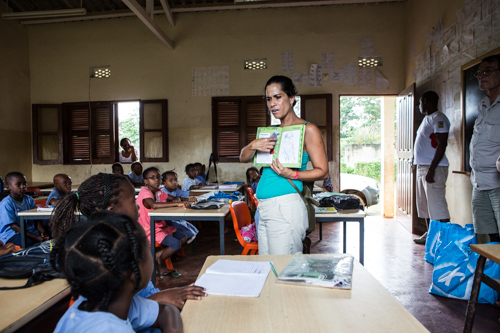 Once again we are deeply grateful for the support of the Omali Lodge (São Tomé) and Roça Belo Monte (Príncipe) for both logistics and lodging and to the Príncipe Trust for partial sponsorship of our on-going primary school education program during GG VII and GG VIII. The island of Príncipe is ancient… at 31 million years of age it is twice as old as São Tomé, yet biologically the two islands are unquestionably related. Along with documenting and describing hitherto unknown species of strange, endemic plants and animals that inhabit one or the other island (rarely, both), we attempt to understand the relationships of these species to each other and to their ancestral populations from the African mainland. For instance among the striking Príncipe uniques is Leptopelis palmatus, the Príncipe giant tree frog (above). Females of this species attain dimensions such that they are largest tree frog in Africa! Males, first described by us, are usually less than half their length. The original specimen upon which the species description was based over a century ago was a single female of 110mm body length (excluding legs). Like all female frogs, they do not have an advertisement call and despite their great size, very few have been found and reported in the scientific literature. A few days ago, Dr. Rayna Bell found the large female pictured above, pressed to the surface of a small flat rock on the ground on a steep, dryish slope in the northwestern part of the island. Females tend to be dark compared to males, but this is the first all-black specimen reported. There are three other tree frog species on the islands, but they are all closely related to each other and belong to a different frog family from the Príncipe giant. Dr Bell has shown that these other three are most closely related to a species from the Ogooué and Congo River basins and thus likely of western Central African origin. Other work has shown that the nearest relative of Leptopelis palmatus of Príncipe is from west of the Niger River and thus the giant is probably of northern (West African) origin, perhaps dispersing from the Niger River drainage..
Dr. Luis Mendes and Maria Jeronimo have continued to collect butterflies to fill in knowledge gaps with species for Luis’s book. Luis has collected a number of specimens that he cannot readily identify; on these poorly-known islands, this is particularly exciting. 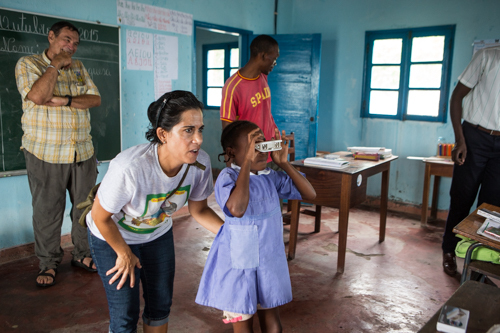 Maria has actually been doing a lot of everything: collecting butterflies with Luis, joining us in the classrooms and going out at night collecting with Dr. Rayna Bell, Lauren Scheinberg and our photographer, Andrew Stanbridge. Considering that this is a “break” from her PhD dissertation work, her energy level is truly impressive. Most geckos are nocturnal but the genus Lygodactylus is comprised of strictly daytime species in Africa and Madagascar. Readers may recall that the islands of Annobon, São Tomé and Príncipe are each inhabited by a single endemic species usually distinguishable by different black markings under the chin; other than these markings, the island species are usually a combination of grey and black. Luis Mendes captured an adult male on Príncipe that appears to be in breeding coloration of a sort I have not seen before in this genus. There is one species endemic to a small forest in Tanzania that is a beautiful blue, several others in East Africa that have yellow heads, and one species in Zambia that has a yellow belly. The male collected on Principe has a bright yellow head and the body that is a striking shade of light green. Not only is this the first time I have observed a green individual, I am also unaware of any literature describing temporary (usually hormonal) color intensities associated with breeding activities in this group of lizards. Many of the photos we post on social media might well suggest that our work is being carried out in some sort of paradise; in some ways it is exactly that but is by no means easy! 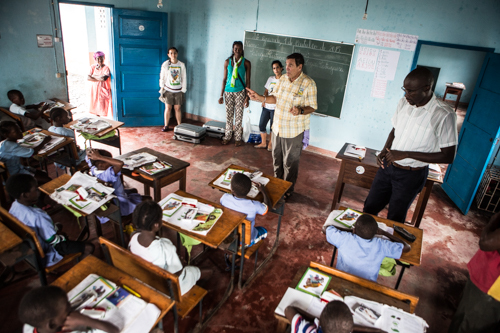 The work we do here is only possible with the support of local entities; this is especially true on Príncipe. On our first two expeditions years ago we had difficulty finding suitable accommodations (reliable power for our equipment, etc) and logistics; there were not many available vehicles on the island, and we had little access to the really interesting higher elevation areas of the island or more remote southern areas. Since that time, our efficiency has increased hugely due to the generous support of several organizations on the old island. First and foremost is the Office of the Regional President (Tose Cassandra-he is also head of the recently created Principe World Biosphere Reserve, and also Daniel Ramos, head of the Príncipe Obo Natural Park. For a number of years, we have been able to stay at Bom Bom Island resort which has also helped with needed transportation, both vehicular and marine. This year we were invited to stay at the new Roça Belo Monte (Africa’s Eden) who also provided transportation and assistance. At one point we planned a boat trip to explore the remote southeastern part of the island but the skipper, Bobby Bronkhorst, of Makaira Lodge fell ill.
Our work is now also in cooperation with the newly formed Príncipe Trust; the Trust played a major supporting role in the production of this year’s biodiversity bird field guide/coloring book and binoculars! Our biodiversity education efforts were concluded for Gulf of Guinea IX here on the old island with our return to the 3rd grade classes of the same schools we have been visiting since 2011. 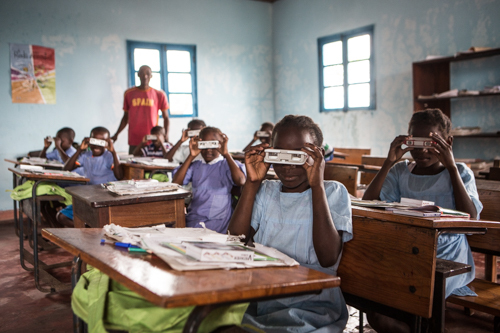 Usually after class visits, we see 3rd graders out in the bush peering through their new binoculars but frequently backwards! This may well be more fun for them. We are most grateful to Arlindo de Ceita Carvalho, Director General, Victor Bomfim, and Salvador Sousa Pontes of the Ministry of Environment, Republic of São Tomé and Príncipe for their continuing authorization to collect and export specimens for study, and to Ned Seligman, Roberta dos Santos and Quintino Quade of STePUP of Sao Tomehttp://www.stepup.st/, our “home away from home”.We gratefully acknowledge the support of the G. Lindsay Field Research Fund, Hagey Research Venture Fund of the California Academy of Sciences for largely funding our initial two expeditions (GG I, II). The Société de Conservation et Développement (SCD) and Africa’s Eden provided logistics, ground transportation and lodging (GG III-V), and special thanks for the generosity of private individuals who made the GG III-VII expeditions possible: George G. Breed, Gerry F. Ohrstrom, Timothy M. Muller, Mrs. W. H. V. Brooke, Mr. and Mrs. Michael Murakami, Hon. Richard C. Livermore, Prof. & Mrs. Evan C. Evans III, Mr. and Mrs. Robert M. Taylor, Velma and Michael Schnoll, and Sheila Farr Nielsen; GG VI supporters include Bom Bom Island and the Omali Lodge for logistics and lodging, The Herbst Foundation, The “Blackhawk Gang,” the Docent Council of the California Academy of Sciences in honor of Kathleen Lilienthal, Bernard S. Schulte, Corinne W. Abel, Prof. & Mrs. Evan C. Evans III, Mr. and Mrs. John Sears, John S. Livermore and Elton Welke. GG VIII was funded by a very generous grant from The William K. Bowes Jr. Foundation, and substantial donations from Mrs. W.H.V.“D.A.” Brooke, Thomas B. Livermore, Rod C. M. Hall, Timothy M. Muller, Prof. and Mrs. Evan C. Evans, Mr. and Mrs. John L. Sullivan Jr., Clarence G. Donahue, Mr. and Mrs. John Sears, and a heartening number of “Coolies”, “Blackhawk Gang” returnees and members of the Academy Docent Council. 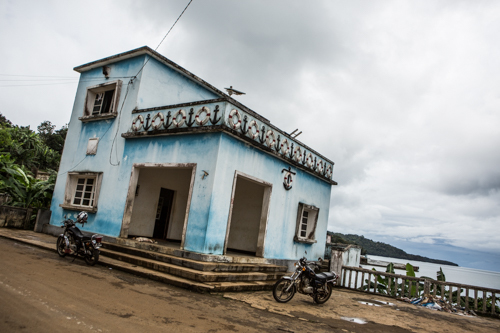 Once again we are deeply grateful for the support of the Omali Lodge (São Tomé) and Roça Belo Monte (Príncipe) for both logistics and lodging and for partially sponsoring part our education efforts for GG VII and GG VIII. The seven members of GG IX all met up in the Lisbon airport on September 18 and arrived the next day in São Tomé. Two new collegues on this expedition are from Portugal. Dr. Luis Mendes, a butterfly expert from the Natural History Museum in Lisbon is finishing a major book on the butterflies of the islands and is checking certain localities for species that have not been seen for many years. 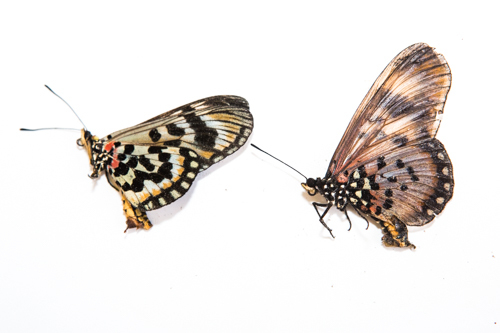 Maria Adelina Jeronimo, a PhD candidate from the Gulbenkian Institute in Portugal, also studies butterflies but specifically the genetics of certain novel morphological characters. Maria is a matter of months from finishing her doctoral dissertation. 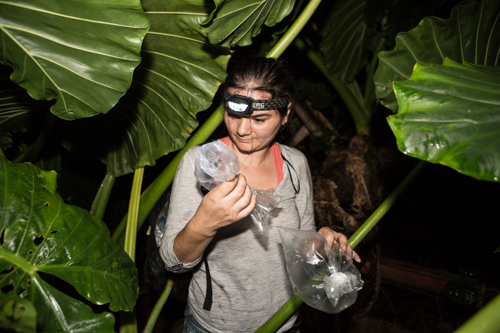 Dr. Rayna Bell has returned for her third trip and is continuing her studies of the interesting hybridization phenomenon that seems to be occurring between the two endemic São Tomé tree frog species, reported in a major publication earlier this year. She has also discovered that the little green tree frogs of Principe, while seemingly nearly identical to those of São Tomé, are in fact a separate species. This does not surprise us really; see earlier blogs on geckos and snakes! Rayna is being assisted by our third new member, Lauren Scheinberg of the Herpetology Department of the California Academy of Sciences. Our brilliant (and very tall) photographer, Andrew Stanbridge, has joined us for the fifth time (also as co-leader). The education team is, as usual, Roberta Ayers and myself, plus our long-time São Toméan colleagues, Roberta dos Santos, Anita Rodriguez and Quintino Quade Cabral. Maria Jeronimo has been assisting. A new cycle begins this year, starting again with third grade. There have been several interesting discoveries already. 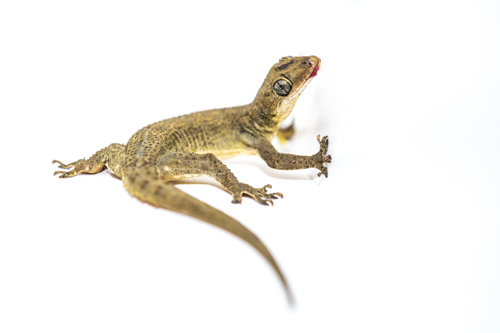 A couple of years ago we published a study of the giant geckos of the islands, describing a new species from Príncipe (Miller, et al, 2012). We suggested that the large endemic species of São Tomé, Hemidactylus greefi, was only found in natural settings, having been out-competed in the towns by common, widespread recent colonizers. 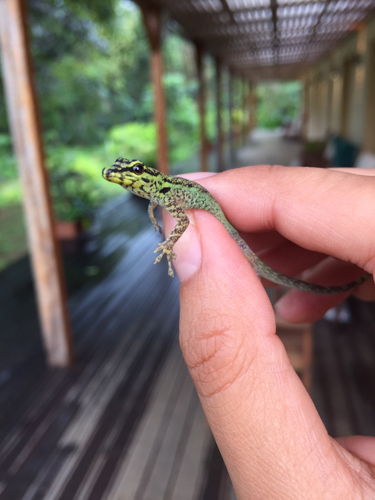 During our first week the group found an adult Greef’s gecko at sea level on a door in Angolares, the second largest town on the big island. I suspect that if competition with widespread common immigrants accounts for the absence of this gecko in the capitol city, there must be fewer of the former in Angolares. This is understandable as Angolares is still quite small and is not by any means a port city; that has always been São Tomé city. As in every year, we went to the Olea tree at Macambrara (1100 m) to check on the known population of the giant São Tomé tree frog, Hyperolius thomensis. Long-time readers will recall that two holes in this enormous tree are the only place we have consistently found this colorful species. 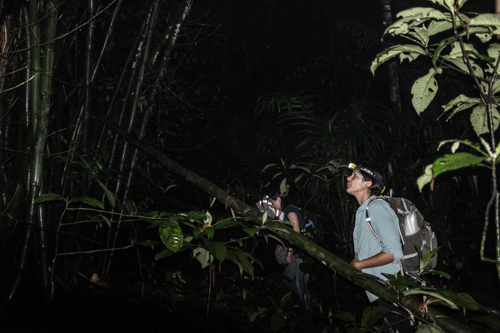 While we have conjectured that the giant tree frog must be widespread in the higher elevation forests (we can hear it call from far above in the canopy), we have been unable to find another locality or tree with appropriate breeding holes… until now! 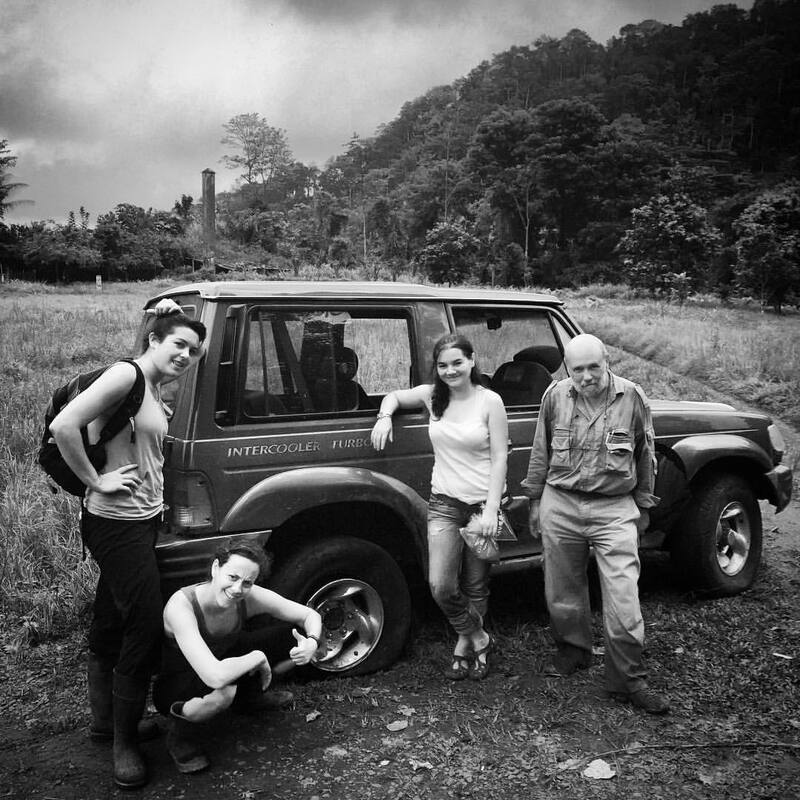 With our colleague, Dr. Ricardo Lima of University of Lisbon, we were able to gain access to the primary forest above the huge southern oil palm plantation of Agripalma. At 350 m, above an abandoned roça called Monte Carmo, Bell, Scheinberg, Lima and Stanbridge found large numbers of the giant São Tomé tree frog breeding in pockets of water on fallen logs. 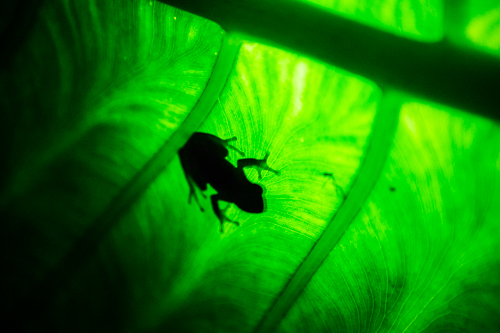 This southern-most locality indicates, as we suspected, that this flamboyant frog is widespread in the relatively undisturbed forest and that while not restricted to high elevation (Macambrara), it does indeed seem to breed in pockets of water such as tree holes, rather than standing water like its close relative. 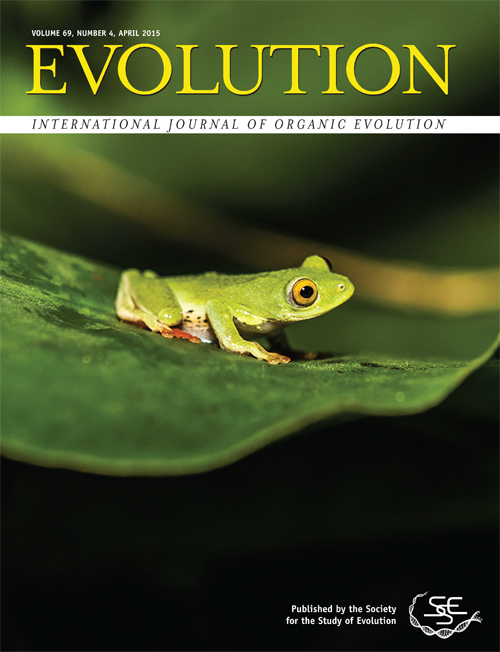 Here, there appears to be no hybridization as the two tree frog species are separated by oil palm rather than less biologically hostile agricultural fields or plots. In fact, so far as I know, hardly any endemic vertebrates or native plants are able to survive in oil palm. This area is also the last bastion of a remarkable endemic bird, the Dwarf ibis, the smallest species of ibis in the world; it is severely threatened, both by hunting and by habitat destruction (oil palm). Notably, there are now two charismatic endemic species, a bird and a frog, endangered by human activities on this remote and fascinating island. So far, this year’s activities have included working in a number of new localities including the central massif and in the far south. High in the mountains above Roça Agua Izé, one of the larger of the coastal colonial cacao plantations, we got our first decent view of a Giant weaver, Ploceus grandis. 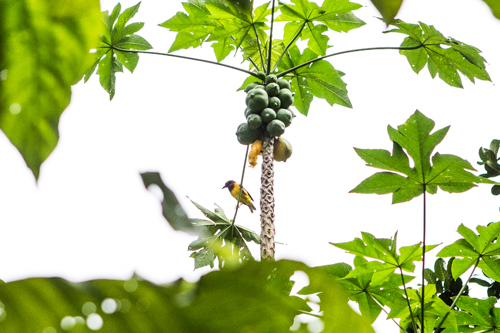 One of many endemic island giants on São Tomé and Príncipe, this colorful weaver is the largest in the world. As always, our educational efforts are aimed at raising the children’s awareness of the unique aspects of the island flora and fauna. We do not preach conservation per se. but rather try to show the young students how special their islands are and thus how special they are as owners. This year, each third-grader gets our coloring book about endemic bird species on both islands, a box of colored pencils and a pair of plastic binoculars (which work!!) These are not just handed out…. we present them personally to each student in each classroom, along with enthusiastic instructions for use, and the reasons we come each year; we involve the students, the teachers, even school principals, and it is great fun. At the end, 10 of our stick-on logo patches are given to the teacher to reward good work. Each of us is involved at one time or another, as voices begin to suffer after 3 or 4 classroom visits. At this point, I must mention some wonderful folks who have been vital to the education effort this year: Alice and Wayne Settle conceived of and sponsored the acquisition of the small binoculars; Jim Boyer of the California Academy of Science once again produced a booklet that qualifies as a work of art, and help with producing the bird books is coming from the Príncipe Trust. In the next blog, I will report on our progress on the smaller geologically ancient island of Príncipe.